Catherine's wedding गाउन is inspired. 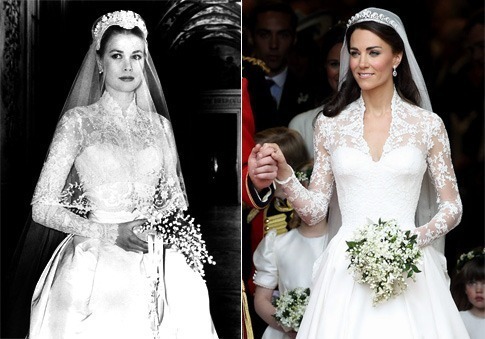 The dress designed द्वारा Alexander McQueen protégé Sarah बर्टन was classic and understated, evoking the quieter glamour of decades past.. Wallpaper and background images in the Kate Middleton club tagged: princess catherine kate middleton wedding gown dress 2011 westminster abbey. This Kate Middleton photo contains वर, सम्मान की नौकरानी, दासी की दासी, सम्मान की नौकरानी के, गाउन, दुल्हन का गाउन, शादी का गाउन, शादी की पोशाक, and दुल्हन गाउन. There might also be गाउन, बागे, balldress, बाल्डडार्ड, बॉल गाउन, and गेंद गाउन.